So, another loom has been in the works over the last couple of weeks. Last year I coveted a little walking loom advertised in Northern California, but just couldn't pull it together while I was in the throes of doing estate stuff. Fast forward to earlier this month when someone on Ravelry procured a Rio Grande kit walking loom. It made me want one of these suckers all over again. The universe has a way of providing even when sometimes it's a "want" instead of a "need". I was looking at the evil Craigslist for a cheap CB loom I could turn into a walking loom when low and behold, there was an ad for a Rio Grande Walking loom in just about pristine condition. 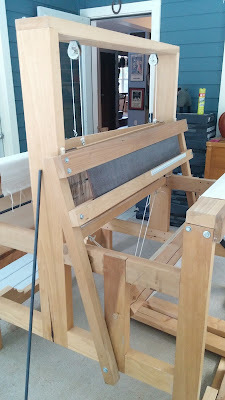 I made an offer, the seller who got it in a storage unit auction accepted and last Saturday I sent the official loom fetcher to Crescent City to meet up and pass that pile of sticks over. 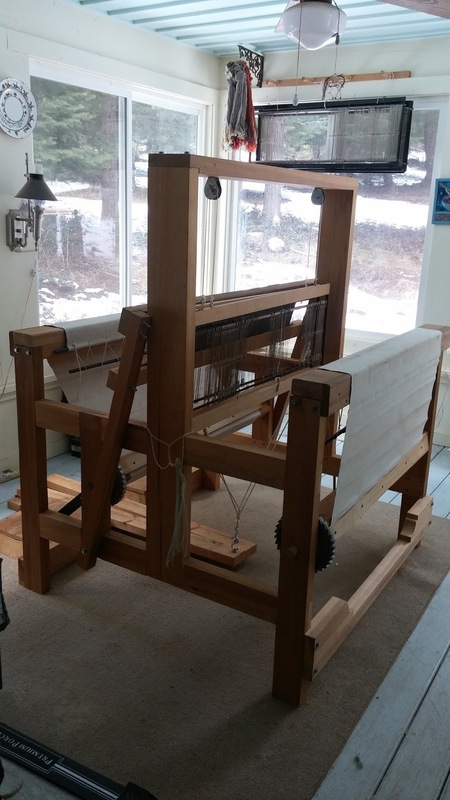 Now I was going to call the loom Moose, because truly, it is a rather ungainly looking loom all done in plain dimensional pine lumbar. But you know, she's going to be a beauty once I finish with her. This weekend I am painting her frame a good deep true red enamel latex and then she will get stenciled and hand painted. I have always wanted to do this with a loom and often wondered why more are not beautifully painted. Hence she will be known as Buttercup or maybe in passing as the Triple B. Plans for a warp are in my head but not on the board...yet, but I am making rag strips from fabric leftovers in prep for some fun rag placemats to do on her. No time like now to get started on the gifts. And my bumblebee warp is just about done on the David. The dang new warping board is lost somewhere between Michigan and Oregon. I hope it arrives soon. In the salon of wadders another one is going into the rag strip bin. 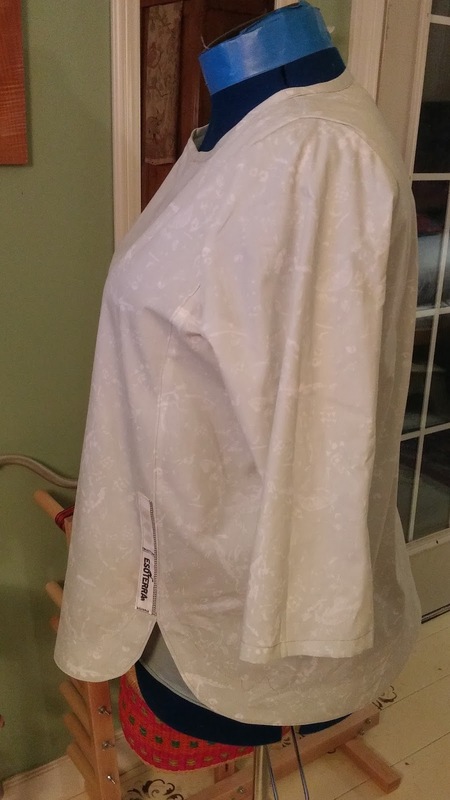 The Sewing Workshop Bamboo Tunic was kind of a mess. It's big and ugly and just all kinds of funky. I'm not upset really because all the fabrics I used where leftovers anyway. There might be a reason it was discontinued back in the day. But there have also been some great successes! 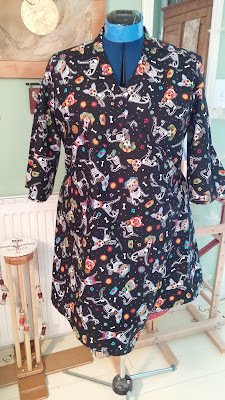 Another Isca tunic made it out in this fun Dog Day of the Dead fabric. I love this print! I rather love the Marilla Walker pattern too. 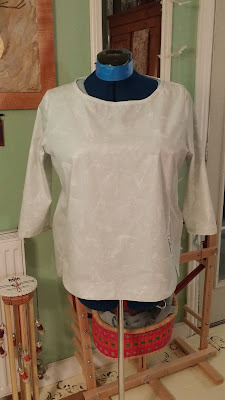 The last make is a pattern from a French designer Anne Kerdiles, the Cezembre Blouse and it is a very nicely drafted pattern. No changes at all out of the envelope. The pattern instructions are both in French and English. 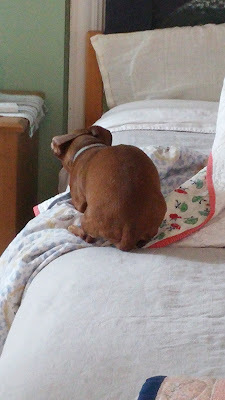 It is a straightforward sew and has wonderful proportions. This will certainly get a lot of use done up in summer weight linens. I'm leaving you all with something a little different, one of my favorite traditional folk songs. I have a number of Custer LaRue/Baltimore Consort CD's. What a voice! It's worth listening to a few others. Parting shots: Bad hair day? What a fun idea to paint the walking loom red! Looking forward to seeing the finished loom with a rug warp on her. Really like the French blouse you made - that kind of blouse is right up alley. It will be fun to follow your progress on painting and then using the new loom. Can't wait to see her painted and stenciled. I've seen a lot of wheels painted, more stenciled with lovely designs but have never seen a loom done - I like the idea. A walking loom!!!! How cool is that??? I can't wait to see her all gussied up! The Cezembre blouse has some interesting elements! I love that detail in the front. 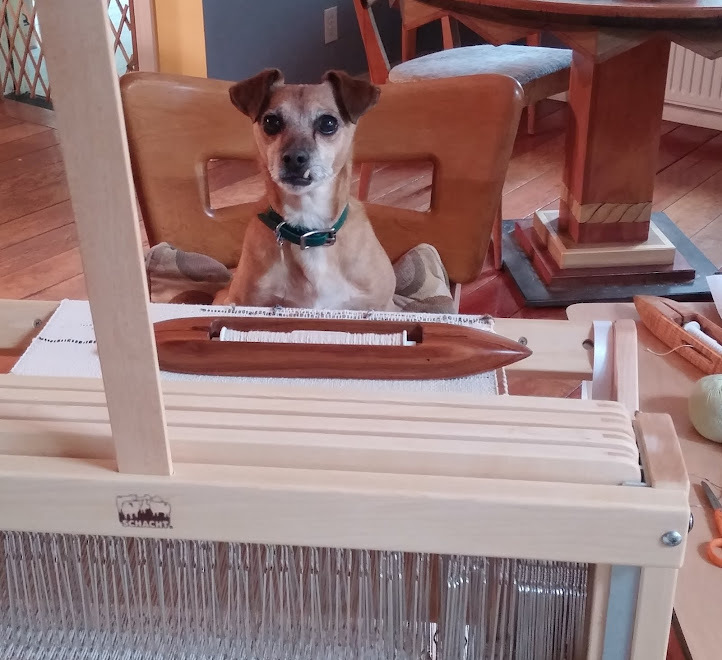 I love your idea for painting the loom! And I am crazy about that Cezembre Blouse. 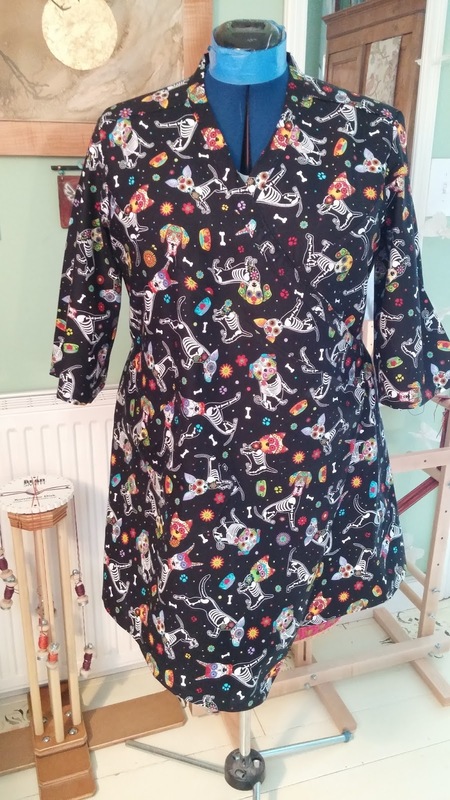 I am unfamiliar with that pattern line but simply must have this. What a simple yet clever design! That is a humdinger of a loom! Can't wait to see it all gussied up. 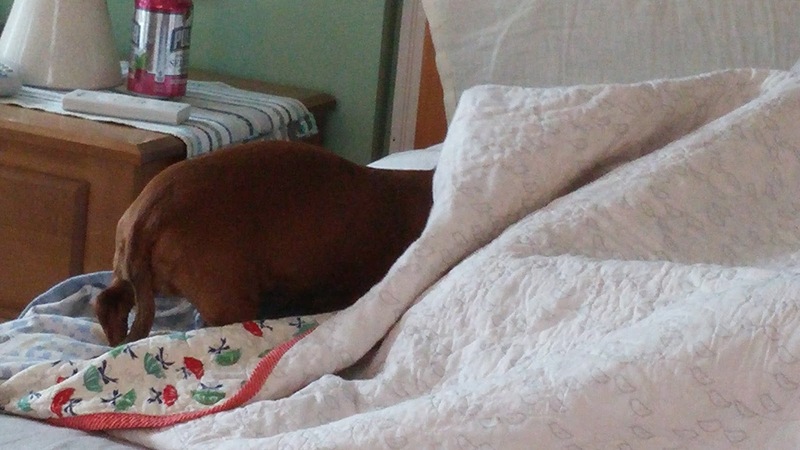 Isn't Mandy the cutest thing ever? Mouse ears! You have an official loom fetcher????????? Get out!!!! I'm with the others on your plan to paint and stencil that loom! It will be a knockout, for sure. I'll await your love - or not - with using a walking loom. I am looking forward to seeing this big red loom, with her stenciled self! Have fun painting. Love the tunic and the blouse above-the Cezembre blouse looks as though it will be a well loved addition to your closet. I’m looking forward to seeing a red loom. I don’t know what a walking loom is but I’ll bet i’m about to find out :-). Oh, and happy belated birthday!!! !